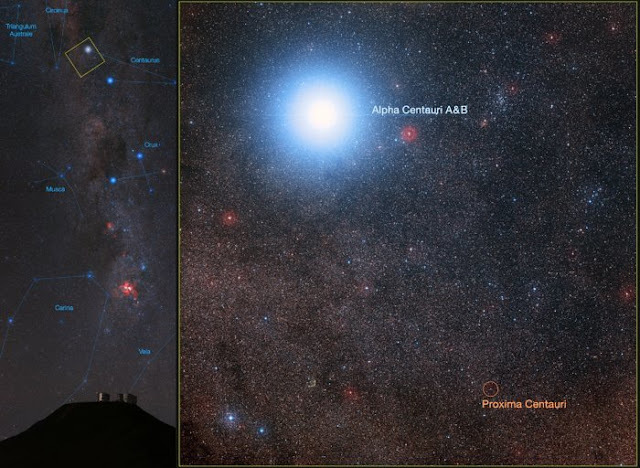 The image below shows the closest stellar system to the Sun, the bright double star Alpha Centauri AB and its distant and faint companion Proxima Centauri. In late 2016 ESO signed an agreement with the Breakthrough Initiatives to adapt the VLT instrumentation to conduct a search for planets in the Alpha Centauri system. Such planets could be the targets for an eventual launch of miniature space probes by the Breakthrough Starshot Initiative. Acknowledgment: Davide De Martin/Mahdi Zamani. ESO, represented by the Director General, Tim de Zeeuw, has signed an agreement with the Breakthrough Initiatives, represented by Pete Worden, Chairman of the Breakthrough Prize Foundation and Executive Director of the Breakthrough Initiatives. The agreement provides funds for the VISIR (VLT Imager and Spectrometer for mid-Infrared) instrument, mounted at ESO's Very Large Telescope (VLT) to be modified in order to greatly enhance its ability to search for potentially habitable planets around Alpha Centauri, the closest stellar system to the Earth. The agreement also provides for telescope time to allow a careful search program to be conducted in 2019. Knowing where the nearest exoplanets are is of paramount interest for Breakthrough Starshot, the research, and engineering program launched in April 2016, which aims to demonstrate proof of concept for ultra-fast light-driven "nano craft," laying the foundation for the first launch to Alpha Centauri within a generation.